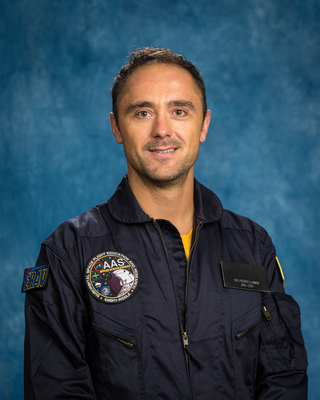 The static Suborbital Space Flight Simulator (SSFS) in the Applied Aviation Sciences (AAS) department at Embry-Riddle Aeronautical University (ERAU) is working together with the Next Generation ERAU Advanced Research (NEAR) laboratory on Daytona Beach campus. The NEAR lab will support the SSFS by using an Energy Management Display Indicator (EMDI) display for rendering live ADS-B data. The data simulated at the SSFS lab will be later shared and transferred to the Next Generation Test Bed (NGTB) at Daytona International airport to be integrated into the National Air System for research and educational purposes. Furthermore, the live ADS-B data will be also used in remote locations using a Ground Based Transceiver (GBT). The SSFS will incorporate real weather scenarios that are currently being processed at the AAS department to mimic real suborbital trajectories or point-to-point (PTP) trajectories between different spaceports. Some of the spaceports to be considered for the NAS include the Midland spaceport in Texas, Spaceport America in New Mexico, Kona spaceport in Hawaii, Kodiak spaceport in Alaska and Cecile spaceport in Florida. Also, PTP trajectories will be generated between the NAS and other international spaceports within the Single European Sky Air Traffic Management Research (SESAR) program among others. Different PTP suborbital flights will allow novel data collection in the mesosphere region providing unprecedented science that will be able to use to refine current mesospheric models and further analyzed the mesosphere. Other benefits of these simulated suborbital trajectories in the SSFS will be to incorporate these trajectories (ascent and descent segments) into the NAS to further familiarize Air Traffic Controllers (ATC) with rerouted aircraft, enhance airport situational awareness, and analyze the Navigation Accuracy Category (NAC), Navigation Integrity Category (NIC) which relates the containment radius, Rc, and Source Integrity Level (SIL) which represents the percentage of exceeding the containment radius. In the U.S. NAS, ADS-B OUT can be operated as a dual link (1090 ES or 1090 MHz and UAT 978 MHz). The UAT is only used in the U.S while the 1090 ES is used internationally, such as Canada, Europe, Asia, Central America and the Pacific. The third ADS-B link is known as the Very High Frequency Data Link (VDL) Mode 4 and it is only used in the north of Europe. What key elements will need to be considered or integrated into international suborbital flights that use different links? How many ground stations will be required to obtain continuous functionality of the ADS-B data? Using different links will provide different data rates during each part of the suborbital flight. For a domestic suborbital flight, the data rate when the vehicle is going through the NAS of the ascent trajectory is the same as the data rate when it is descending through the NAS. For a suborbital flight that may depart from a spaceport in the U.S. and arrive to another spaceport in Europe, the data rate during ascent and the data rate during descent may not be the same and the suborbital trajectory will require further assessment from the space operations point of view. Some of these operations include communications with aircraft during the ascent suborbital trajectory, acceleration management of the trajectory, trajectory course corrections to pin-point at the right noctilucent (NLC) layer, maximizing the science during the short time in the weightlessness environment, re-entry concerns, and energy dissipation management and communications with the NAS during the descent trajectory.